Register Log In ECN Forum Forums Violation Photo Forum Second Meter Installed Still in Use? Doesn't the electric utility company have anything to say about this apparent violation in Lynn, Massachusetts? This has been this way for many years. Can the AHJ let this slide? The violation is covered in 110.14 for starters. PS: Now the entire building is painted light blue! Joe obviously I can not see inside the house so I will just take a guess from personal experience. The second meter was installed for off peak metering of an electric water heater. Even if the occupants have stopped opting for off peak metering the meter socket and meter remain to feed the water heater. From the 'added' meter it would run inside to a separate service disconnect a fused switch or 2 pole breaker enclosure. From there off to the water heater. The installation if done correctly is perfectly code compliant. The idea is you pay a reduced kWh price for the water heater but a time clock shuts the power down at peak usage times. Heres what I do not know. I am not sure if a special meter incorporating a time clock is used or if the time clock is located inside. The only time I have run into this the occupants or power company had discontinued the off peak option. so each month the meter reader reader reads both meters and you pay the total of both for your monthly bill all at the same rate. Maybe you could ask your friend the meter guy about this. As far as the 110.14 violation you certainly could be correct but it may not be covered by the NEC. I believe many times these where done by POCO subcontractors without permits and with the blessing of the AHJ. This was located outside of a grocery store, then a fast food place, and I will check again soon to see what is there now. If we considered the "Off Peak" installations that are considered as being legal, this rule and 2002 NECH commentary. Service-entrance conductors shall be permitted to be spliced or tapped in accordance with 110.14, 300.5(E), 300.13, and 300.15. Splices are permitted in service-entrance conductors if the splice meets the requirements of 230.46. Splices must be in an enclosure or be direct buried using a listed underground splice kit. It is common to have an underground service lateral terminate at a terminal box either inside or outside the building. At this point, service conductors may be spliced or run directly to the service equipment. Splices are permitted where, for example, the cable enters a terminal box and a different wiring method, such as conduit, continues to the service equipment. Splices are most common where metering equipment is located on the line side of service equipment, service busways, and taps for supplying up to six disconnecting means. See Exhibit 230.24 for splices permitted in metering equipment. Also, the meter socket enclosure is part of the Article 312 inspection made by the AHJ and the installation above should have never been passed. I am not aware of any local or state rules in Massachusetts permitting this. Maybe the installation was accepted by someone, who was not familiar with the rules. I would ask about the liability if there was a fire? Joe I will not argue with you about this as I too would like power companys handy work like this to be inspected. That said this is power company metering under the control of the power company, it is their seal on it. 90.2(B)(5)(a) clearly states it is not covered by the NEC, now the raceway leaving the meter, the added disconnect etc. are another story. Again I remind all I am guessing to this extra meters purpose and a further guess is at the time the inspector looked at the service there was only one code complaint meter socket in place. Then at some point the POCO subs came in and added the off peak meter. However we feel about it, it is a common situation. By the way what are you doing walking around in Lynn? I hope your 'carrying' if you know what I mean. All that aside it certainly could be an illegal second service. 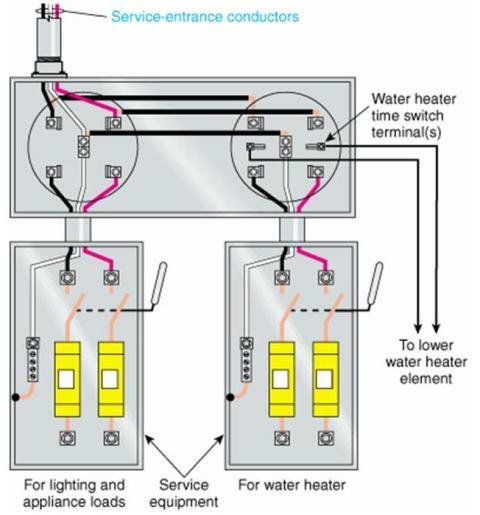 While it is true that most "Off Peak" meters are connected illegally to supply the water heater element during the early am, this www.necdirect.org 2002 NECH image shows what I believe to be the correct way. PS: I took the picture a few years ago near my in-laws house on Chatham street, now occupied by another family. I do not walk around those street, me with a piece, no I think not, I would probably shoot myself in the foot! Did you take the day off for Valentine's day? Yes that is a much better way, I just recently removed one like that in Walpole. Don't ask why the company had me doing a residential service change. I am sure it was a 'freebie'. No I did not take V day off, I am home playing Mr. Mom while my wife is sick with a cold. You what I am thinking Joe? That the two gang socket approach is how an electrician does it from scratch. The 'bang another one on the side' approach is how it is done as an add on to existing service. Done by POCO subs without permits and inspections. I work for a utility that has off-peak metering using two meters. The off-peak meter has a timeclock and built in 30 amp 2 pole relay to control the lower element of the hot water tank. As for the installation, we require a licensed electrician, working for the home owner, perform all electrical work for our off-peak metering, including providing and wiring the meter sockets. The off-peak system we use, saves the customer approx 40% of the cost to heat their hot water. I agree that using a gutter is a nicer way to do things. That said, this was once a practice so common that older, round meter pans often has threaded hubs on the side, for feeding the other meter. Here in Reno, the practice of differing rates for heating water are long gone, and the second meter is removed when a service change is done. Indeed, this work may be the result of a non-professional doing a DIY or non-permitted service change, replacing the fuses with breakers. Or, considering housing prices, it may be the result of converting a basement, etc., into an apartment. How can we argue about this without even knowing what it is for? What exactly is the violation?